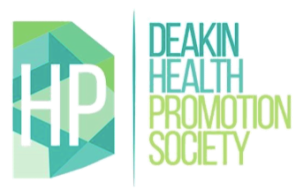 ﻿"Health promotion is the process of enabling people to increase control over, and to improve their health"
The Deakin Health Promotion Society (DHPS) is a student society at Deakin University, in Burwood. We are a professional student society with around 70 members. We are affiliated with the Deakin University Student Union (DUSA). The DHPS is made up of 9 student committee members. We work closely with the Health Faculty Staff, JobShop staff, other student societies and health professionals in the field. The DHPS strives to build the network of its members by connecting them with like-minded students, health academics, health professionals and volunteer coordinators in the field. Our events are geared towards professional development to assist our members in finding a meaningful career in the health industry. DHPS also assists students with engaging in volunteering opportunities, both individually and as a group. The DHPS has a strong social conscience and works hard to support ethical and sustainable practice. Whether you are taking your first steps in the health promotion industry, strengthening your current skills or have a general interest in health - the Deakin Health Promotion Society is for you!